In many educational and commercial establishments the idea of connecting multiple monitors to one computer for cost-effective computerization of workplaces is not a new one. If you are interested in equipping additional employee workplaces without large expenses, you’ve come to the right place as IBIK makes it possible to use one computer for multiple users. We are proud to offer you a full-featured ASTER software solution designed to multiply computer performance while supporting several users simultaneously. If compared to using separate computers, running one computer for multiple users with ASTER ensures a better value for your money and can be recommended for office units, banks, educational establishments, Internet cafes and other commercial and home uses. Actually, the main reason for connecting multiple monitors to one computer is economic benefit as you can reduce costs of equipping workplaces for employees in several times. Moreover, since you just multiply computer functionality without purchasing bulky equipment, the whole system takes up much less space while electric power is saved as well. In order to run multiple computer monitors from one system unit, there is no need to buy separate motherboards, microprocessors, RAM and other costly components for each user. After the connecting of one more monitor, keyboard and an extra mouse to the available shared computer, you will easily set up an additional workplace. 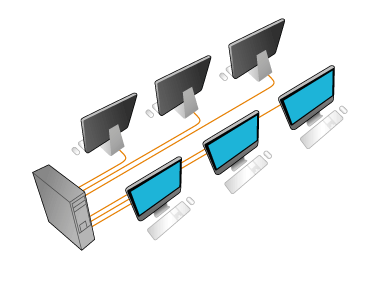 Be assured, when you multiply computer workplaces, you don't have to set up the local network once again as all common resources and devices are automatically accessible from every station. Whether you have a limited amount of space or want to reduce costs on computerizing your office, setting up multiple computer monitors is the right way to go. Take advantage of our powerful ASTER software, multiply computer performance and increase your business productivity while using one computer for multiple users.